Ten to forty percent of the patients with acquired immunodeficiency syndrome (AIDS) develop cytomegalovirus (CMV) infections. In some patients with AIDS, CMV is detected in the bronchoalveolar lavage fluid (BALF), urine, and other specimens, even when there are no symptoms of CMV disease. An indicator of active CMV infection is needed to facilitate the diagnosis of CMV disease in patients with AIDS or HIV infection. CMV p65 antigen was detected in the leukocytes of both the peripheral blood and BALF during the early phase of CMV disease. 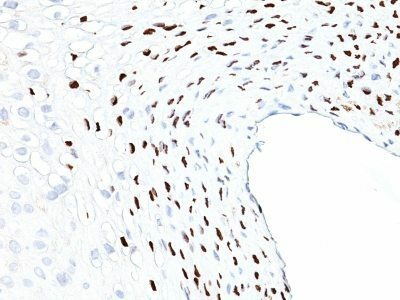 Catalog number key for antibody number 0101, Anti-CMV-p65 (CMV101) The prefix indicates conjugation, followed by the antibody number and size suffix.